Like popcorn and movies go together, so do Denon and home theatres. But, if you want the best experience, choose wisely. Denon is brilliant at home theatres. Immersive audio performance with five powerful amplifiers. Connect to all your favourite media devices with five HDMI inputs. Full 4K Ultra HD and Dolby Vision. Seamless pass-through of the latest picture and audio coding from your TV to the AVR. Seamless music streaming on Bluetooth. The Denon AVR-X550BT can remember up to eight paired devices, so the more the merrier – let everyone bring their favourite playlists and share! To stream, simply select the Denon AVR-X550BT from the Bluetooth menu on your smart device. Guided out-of-the-box set-up assistance. The quick-start guide is simple and clear, even down to connecting the speaker wires. A measuring microphone that adjusts critical system parameters for top-audio fidelity, tailormade for your speaker system and listening pleasure. A 100% true lossless multichannel sound from your AVR, Blu-ray, or other devices. A front panel USB input gives you convenient audio playback. The AVR-X550BT is likeminded with a wide range of portable USB devices and supports MP3, WMA, FLAC, and MPEG-4/AAC tracks. So, it’s totally your call – your best MP3 download or a top-quality FLAC recording. Either way, your ears will be soaking up pure bliss quick and easy. Audio is also a big deal with home theatres, and the AVR-X550BT understands this. When you switch between sources, this little genius will adjust the EQ settings to your preferences for that particular source. Use the four Quick Select buttons on the front panel or use the same Quick Select buttons on the AVR remote for even faster control. Speaking of control, how about having it in your back pocket? The Denon 500 Series Remote App gives you this – adjust the volume, turn it on or off, mute your playlist, or select a source. 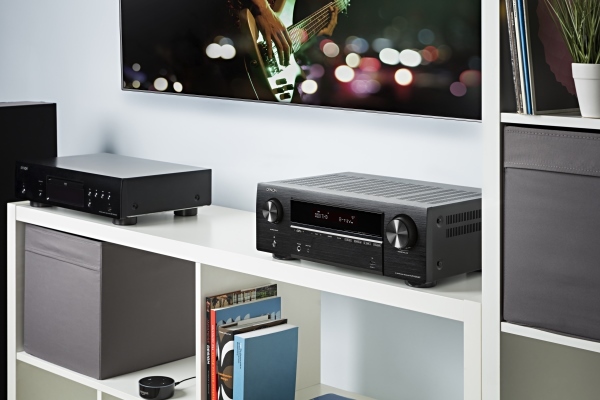 And, connect the AVR-X550BT to the Denon HEOS Link (sold separately) for wireless music streaming and the absolute ultimate in sound quality. You can play back nearly limitless online streaming services, like Spotify, TIDAL, and much more, and once connected, use the HEOS app to control the AVR remotely. We have no idea how long popcorn has been around, but we do know that Denon has over 100 years of experience in audio technology – so be assured that you’re pretty much in for a gourmet experience with their cutting-edge home theatre equipment. A century is a very long time to be dabbling in audio and they’ve nailed it – long ago – by being Japan’s first audio electronics manufacturer and producing the world’s first commercial CDs. They’ve never stopped investing in research and development, and the results are millions of happy customers who get to enjoy the latest and highest quality audio available on the market today. Do you want to be a very happy audiophile? Consider the AVR-X550BT as your next investment.